For those gadget lovers amongst us, there's a $250,000 Navy guidance system. Maybe all the military transports were full that day? Also, there's a camera designed specifically for the space shuttle. Perhaps someone at NASA was delivering it to a buyer (if that's the case, we doubt the engines will be "mailed" in quite the same way). 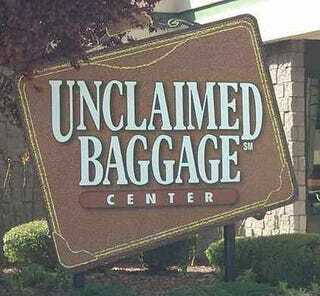 Just add some unclaimed weaponry and the Unclaimed Baggage Center might be comparable to the armies in some third world countries. For movie buffs, the original Hoggle puppet from Labyrinth was also lost and found by the Center, as was a real, live snake on a plane (rattlesnake).